Severe sexual harassment by her supervisor in her first job after college drove Jennifer Coburn to fight back and win a legal settlement. She then interviewed a hundred other women to gather their stories of sexual harassment on a variety of jobs. She presents and analyzes her own experiences and those of the women she interviewed, emphasizing the strong and painful links between women's issues at the workplace and a woman's psyche. "Finding women to interview for this book was depressingly simple," observes Coburn in her introduction. "I placed a small advertisement in the local newspaper and was immediately inundated with phone calls from sexually harassed women. Every person I mentioned my research to had a friend, cousin or colleague waiting to be interviewed... I met women from over a dozen ethnic backgrounds, ranging in age from 19 to 74 years. Some recalled sexual harassment from the World War ll era while others recollected events only hours old. I met women in their one-room apartments and their luxurious estates — sexual harassment knows no socio-economic boundaries." 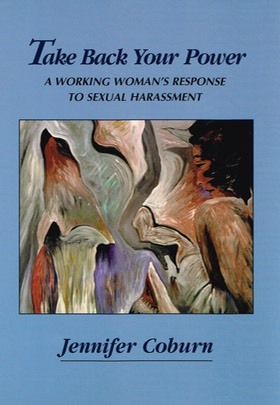 Harassed women and low self esteem form a central theme and challenge of Take Back Your Power. "Voicing your self-esteem by championing your own cause sends a clear and unobstructed message to every corner of your being," observes Coburn. "Saying, 'I am important and I deserve to be treated with respect' should be easy. Yet many people suffocated by a lifetime of abuse do not express these thoughts." Passivity in the face of harassment demoralizes women and low self esteem becomes entrenched. "If you know a woman who is being sexually harassed or has been in the past, reach out to her," urges Coburn. "Let her know that her silence is destructive not only to herself, but to other women as well. There is no nobility in tolerating pain..." As a victim of, and successful combatant against sexual harassment, Coburn brings keen insights into one of the most crucial and topical of women's issues. 141 pages, with index. JENNIFER COBURN has worked as public affairs coordinator for Planned Parenthood of San Diego and Riverside counties. She has authored many articles and opinion pieces on reproductive rights, women in politics, affirmative action, current events and human rights — as well as woman-centered novels, such as Reinventing Mona and Tales from the Crib. Paperback • ISBN: 978-0-910383-13-4 • $10.